Bob Barton spent ten seasons off and on- as a back-up catcher for the San Francisco Giants- 1965-69, San Diego Padres 1970-72, Cincinnati Reds 1973 and finishing up with the Padres in 1974. Barton was 6’0″ 174 hit and threw right-handed. During his career Barton was known as a fine defensive catcher but a weak hitter. Over the years the catching position may be the quickest path to the major leagues. You can make a living being a good glove- no hit catcher as a back-up and hang around forever. Back in 1969 it seemed like there were a lot of catchers who even played regularly who were not much at the plate with a bat. 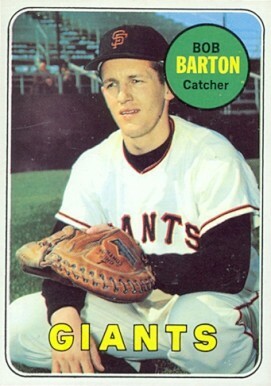 Bob Barton broke in briefly with the Giants at the age of 24 in 1965. The Giants had a fine catcher at the time in Tom Haller and Barton had only one season with the Giants where he had more than 100 at bats-the 1969 season and he hit .170 that year. He spent a lot of time going back and forth between the Giants and their AAA minor league team. During his minor league career he was named to All-Star teams five different times. In December 1969 he was traded to the San Diego Padres in a deal of no real significance to either team as it turned out. His second season in San Diego is the only year where he was a semi-regular- appearing in 111 games and starting a majority of games 97. It would also be his best year hitting- with 5 home runs 23 RBI’s and a .250 average. In 1972 he was back to the bench and then in June of that year was traded to the Cincinnati Reds in an exchange of back-up catchers- for Pat Corrales a future major league manager. Barton would spend the rest of 1972 in the minors. He would be a back up for Johnny Bench in 1973 before returning to the Padres in 1974 where he finished his career. Bob Barton’s final game was on his 33rd birthday- July 30, 1974. Bob Barton passed away this January at the age of 76.